The geniuses behind the Ember Prison Core have done it again! By throwing one into reverse they have created a prison of eternal frost. Now that's how you put a criminal on ice. The Eternal Frost Ember Prison Core Trap Skin can be used on the Ember Prison Core Trap. The trap's stats (power, power bonus, attraction bonus, etc.) are not changed. The Eternal Frost Ember Prison Core Trap Skin may be made available during the annual Great Winter Hunt event and can be traded on the Marketplace or through Give To Friends. 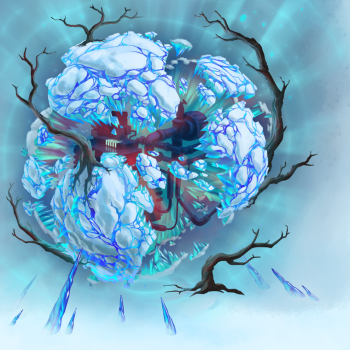 11 December 2018: The Eternal Frost Ember Prison Core Trap Skin was released as part of the Great Winter Hunt 2018. This page was last edited on 6 February 2019, at 14:48.